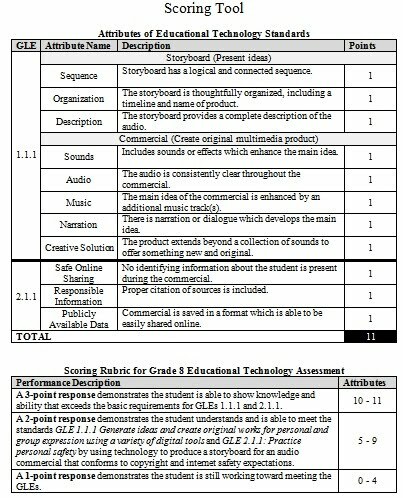 I'm spending the weekend working my way through hundreds of tiny edits to our edtech assessments. Although every document is intended to be slightly different (grade level, subject matter), there are some commonalities. It is this need to ensure that there is not only common language among the pieces that are the same, but articulation through the grade levels. It's tedious, but important, work. These are the last of the pieces before this project makes it debut. One of my last decisions is how to name something: our scoring "tool." It's not really a rubric. It's not really a checklist. It's two great tastes that taste great together. We modeled this tool after some that have been developed for science and math questions used on the state tests. Here's how it works. Each Grade Level Expectation (GLE) has been broken down into its main ideas for a particular grade level. These appear in the "Attribute Name" column. Next to each is a "Description" of an at standard performance. This is where the checklist format makes an appearance. Either the student gets the point...or s/he doesn't. The teacher only has to decide whether or not the student evidence fits the description. Points earned are totaled and then compared to the second table in order to make an overall determination about the student's ability to meet the standards. This is where something more qualitative and rubric-y comes into play. I'm not sure what to call this sort of a combo tool---it's the Swiss Army Knife of scoring options. Science and math do refer to it as a "rubric," but I'm not so sure that's the right word. We aren't identifying a range of quality in the performance. Although the first portion really is a checklist, that word isn't enough to describe the whole thing. Any suggestions for this whatchamacallit? For AP exams, they are called Scoring Guidelines. All great ideas (and thanks for the compliment, Brooke!). It looks like we're going with "Scoring Guide." This will likely be one of the things we ask about as we move things out for field testing.